Cantor's Loss In Va. Is Immigration Issue's Death Knell. Or Not. : It's All Politics Immigration was a key issue in Tuesday's primary. 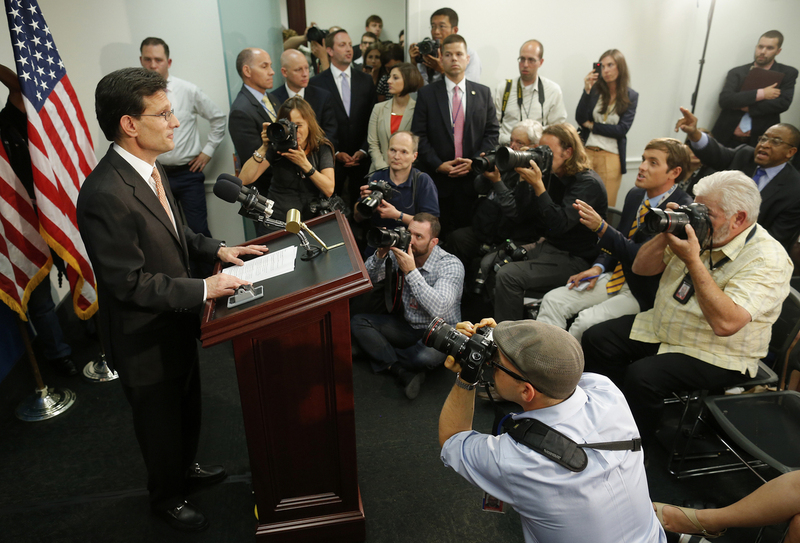 Rep. Eric Cantor's defeat may discourage others from promoting policy changes. But some advocates say the outlook for overhaul isn't so bleak. House Majority Leader Eric Cantor's loss in his district's primary is seen by many as the end of a chance at immigration overhaul any time soon. As the smoke clears from the wreckage of the Republican establishment's monumental loss in the Virginia congressional primary, it appears that hopes of immigration overhaul have been snuffed out. Economic professor Dave Brat, who beat House Majority Leader Eric Cantor on Tuesday, made immigration policy a major part of his argument against Cantor. Passage of significant new immigration legislation was unlikely to begin with in a midterm election year, during which Republicans hope to capture the Senate and expand their majority in the House. But Cantor's loss appeared to make the demise of any such legislation official. That certainly was the takeaway message from some Washington types who have been pushing for an overhaul of the immigration system. "The votes have been there for months to pass immigration reform, if House Speaker John Boehner were willing to take legislation to the floor. Now, however, immigration reform is dead for the year — and Republicans killed it," wrote James Manley of QGA Public Affairs. Manley, who has pro-immigration-overhaul groups as clients, was once a top aide to Nevada Democrat Harry Reid, the Senate majority leader. Those in favor of stricter policies viewed the immigration-overhaul train as being completely derailed by Brat's unexpected victory. Mark Krikorian, executive director of the hard-line Center for Immigration Studies, told It's All Politics that most Republican legislators could take or leave the immigration issue and would read Cantor's defeat as a reason to punt. "They don't believe in it that much, but they're politicians and they're trying to manage this issue," Krikorian said. "Well, this is now a data point that they have to factor in, a very big data point." He said those members of congress will likely turn their attention to other issues. "So there's no chance any large legislation is going to go this year. I didn't think there was before," Krikorian said. "And I don't even think there's a chance for any smaller, targeted thing." Eric Cantor's Collapse: What Happened? Several factors likely contributed to Cantor's defeat: a redrawn district that included more rural conservatives open to Brat's hard-line fiscal message, Cantor's funeral-director demeanor, his campaign taking Brat too lightly until it was too late, the congressman's failure to dampen the anti-incumbent mood of his district's voters early enough. But it's the immigration issue that, rightly or wrongly, has been getting much of the blame. Despite the conventional wisdom that any chance of overhaul is now gone, some supporters warn against such hasty declarations. "If we learned anything from [Tuesday] evening, it's not to make flat predictions about what is and isn't going to happen in American politics," said Whit Ayres, a Republican pollster and political strategist. Ayers suggested to It's All Politics that many observers are looking to the wrong race to draw conclusions. "We had a great case study yesterday in the impact of immigration reform in a Republican primary," Ayers said. "That case study did not occur in the 7th District of Virginia. It occurred in a more conservative state, in the Senate Republican primary in South Carolina." Sen. Lindsey Graham, who won his primary race Tuesday, is much more closely identified with immigration overhaul than Cantor. Cantor has supported addressing immigration issues on a piecemeal basis, including giving legal status to young people brought to the U.S. by their parents. But he's never been a leader on the issue. By contrast, Graham has been closely tied to efforts to make comprehensive changes to immigration policy, deeply involved in writing legislation and negotiating with Senate colleagues. In both 2008 and 2014, Graham performed well at the polls, crushing primary opponents who opposed his immigration stance, all while being a "prominent promoter, writer and defender of comprehensive immigration reform," pollster Ayers said. Similarly, Republican Rep. Renee Ellmers of North Carolina performed well in the primary last month in her conservative district, even though she has advocated for changes to the immigration system. Ayers argued that Ellmers' success shows the issue isn't the political kryptonite some are making it out to be. Ayers was part of a group of Republican pollsters who took part in a Wednesday morning event — scheduled before Cantor's loss — to examine the broad, bipartisan support for an immigration revamp. The event was arranged by FWD.us, an advocacy group underwritten by tech moguls like Facebook's Mark Zuckerberg, to promote new immigration legislation. Rob Jesmer, the group's campaign manager and a former executive director of the National Republican Senatorial Committee, sounded a realist note. Of the fallout from Cantors defeat, he said, "I'm not going to argue that it was helpful. It wasn't." "Right now it looks bleak," he told It's All Politics. "But we have to let the dust settle and wait a week or so and let everybody get back in their rhythm. "We still have a structural problem that leadership and most Republican members understand, which is, we cannot win the presidency by winning 13 Southern states. That doesn't get you what you need to get to the White House. The only way to do that is to dramatically increase our share of the Hispanic vote. That is not going to happen as long as this issue is alive, and we're seen as blocking it."